The 5th Avenue Theatre in Seattle is hosting a cross-cultural musical called “Waterfall,” based on a best-selling Thai novel and featuring one of Thailand’s biggest music stars. Can a splashy romantic musical set in Thailand and Japan, featuring one of Southeast Asia’s biggest celebrities, become an American hit? That’s the goal for “Waterfall,” starring Thai pop star Bie Sukrit. Currently in previews at 5th Avenue Theatre, it opens to the press on Thursday, Oct. 15, and closes Oct. 25. Guiding forces behind this cross-cultural venture (which debuted to mixed reviews at L.A.’s Pasadena Playhouse this summer) are the veteran Broadway team of writer Richard Maltby Jr. and composer David Shire, and co-director Tak Viravan, a leading Thai impresario who bridges Broadway and Bangkok. Book and lyrics by Richard Maltby Jr., music by David Shire. Through Oct. 25 at 5th Avenue Theatre, 1308 Fifth Ave., Seattle (206-625-1900 or 5thavenuetheatre.org). Set in the 1930s, the novel concerns a young Thai man, Noppon, who falls in love with a married, aristocratic Thai woman he meets while studying in Japan. Captivated in his youth by a touring version of “The Sound of Music,” the adult Viravan became a Broadway investor, and opened his own spacious theater in Bangkok. 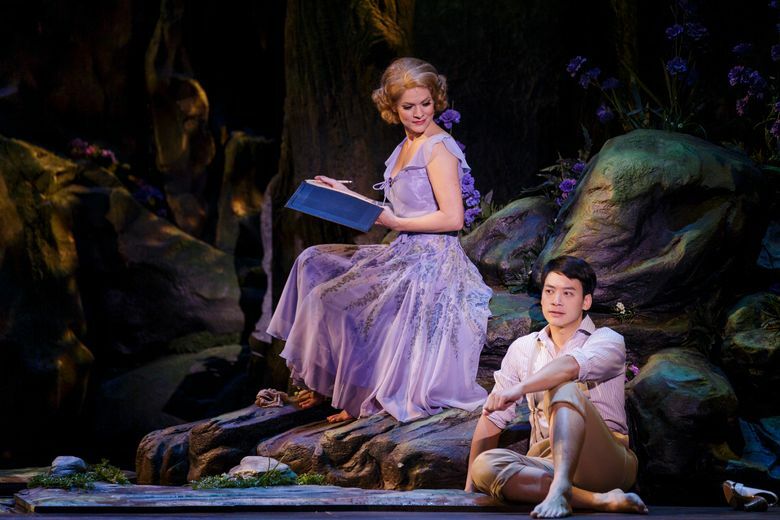 It introduced Western-style musicals, Broadway classics and new shows to Thailand. Viravan hand-picked the “Waterfall” male lead in advance. In 2006, Sukrit was runner-up on “The Star” — a Thai TV talent contest Viravan also produces. Now a pop artist and TV actor described by Maltby as “the Justin Bieber of Thailand” (without the bad boy antics), Sukrit performs opposite a new leading lady in Seattle: frequent 5th Avenue star Laura Griffith. In Pasadena, “Waterfall” was praised for its opulent production values. But it also received stinging criticism, particularly for its book, deemed “clicheed” and “banal” by some reviewers.